History: Ray was a Grade A, AA and Stakes racer at Palm Beach. He was the winner of the 2012 Palm Beach Father's Day Feature, the 2012 Palm Beach Budweiser All-Star Feature and was second in the 2011 Palm Beach Bob Balfe Puppy Stake. According to trackinfo.com, Ray had 75 races, 63 of which were "in the money" and 47 of them were wins. 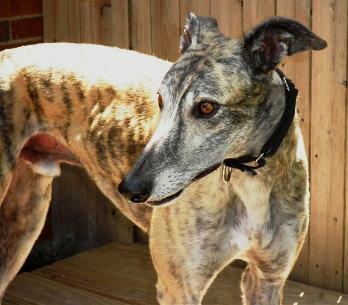 Unfortunately, at the end of a race in July, 2012, Ray had already crossed the finish line when another dog ran into him, fell on Ray and broke Ray's right back leg. That, of course, ended his career. Ray's leg was set and it healed. He shows no lasting effects because of the break. Because of his racing promise and due to the marvels of medical science, Ray's legacy may yet be passed on in future litters of pups. 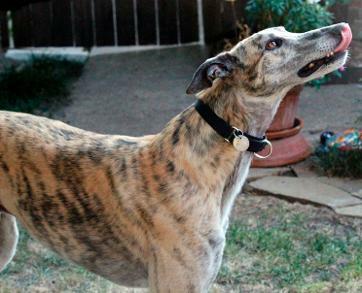 At age 4, Ray is now ready for retirement and is looking for a lifetime home. 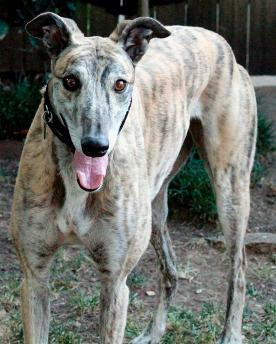 Ray's light brindle markings make him a striking boy. He's a SMILER and never fails to greet you with a shake of the head and a big smile. Check out one of Turbo Razor's winning races! Ray in his new home with his new family, John, Jack, and Kami. 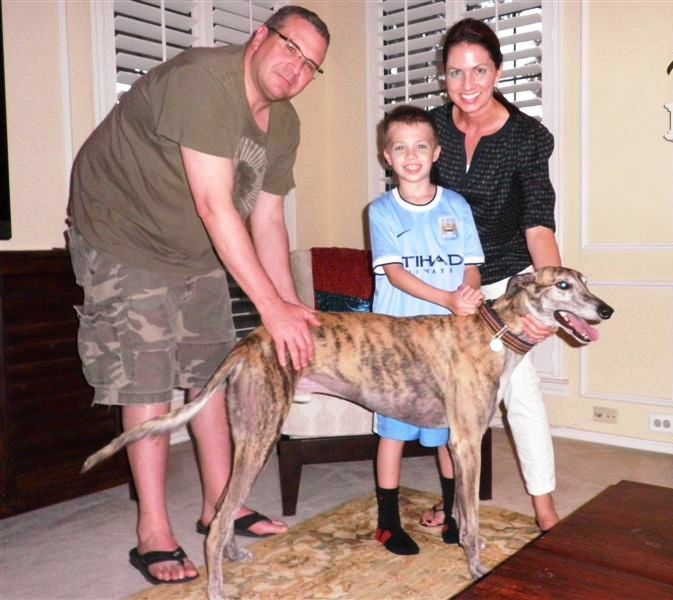 August 11, 2013 update: Ray found his lifetime home with John, Kami and Jack. Congrats to all! 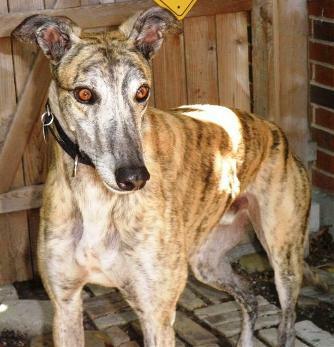 July 18, 2013 update: Ray has integrated seamlessly into the household of other Greyhounds. Although he is an enthusiastic boy, he has no difficulties with any of the other dogs. He is excited about life but is not pushy. He seems to be a well rounded boy. I wish we could get a picture of his silly smile. That you may just have to see for yourself. July 4, 2013 update: Ray came to TAGS yesterday and seemed to be fairly relaxed about it once he got into the car. When you put a leash on Ray, he gets very excited because he thinks he going to run. He knows his name and responds. He smiles and ( sometimes ) snaps his jaws when he greets you. 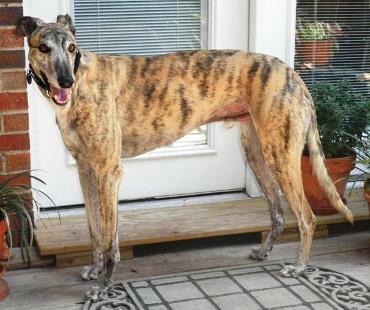 He was described as an "enthusiastic" greyhound. Ray is a very friendly boy. His owner said he had been in the house periodically and that seems evident. He is settling in nicely. July 3, 2013 update: Ray came to TAGS to find his lifetime home and to settle into retirement.